Looking for a house that fits your lifestyle and budget can take some effort. Narrow down your search to modular homes for Kinston residents. This type of house is built in an indoor setting before being transported to your location for assembly. When you get modular homes for Kinston citizens, you can have control over how your house will look like before it is made. We have Kinston covered when it comes to modular homes. Modular homes in Kinston cost less. If you plan to buy a new home, you must be aware of how much money you'll have to save up for it. Modular homes in Kinston are a great option for people who cannot allot funds for an on-site built house. Quality will never be compromised when you choose modular homes. Kinston families who seek a good house at a price that won't break the bank will benefit from this residential structure. Modular homes in Kinston are made faster. Inclement weather and other external factors tend to delay the construction process of stick-built residences. You will never encounter this issue when you choose modular homes in Kinston. Since this type of house is constructed indoors before it is set up at your location, manufacturers do not have to stop building when it rains or snows. As a result, people who choose modular homes in Kinston can move in to their new residences in just a matter of weeks. Modular homes in Kinston leave zero waste. Unlike stick-built houses, modular homes in Kinston do not leave waste once it has been placed permanently in your area. This residential structure is brought by parts from the manufacturer's site to your property. All the necessary features of modular homes in Kinston are installed prior to delivery. By the time it is assembled, there will be no mess or materials that need to be cleaned up. Modular homes in Kinston are customizable. The downside of buying existing stick-built houses is that some features might not suit your taste or lifestyle. With modular homes for Kinston residents, that is not the case. Not only will you get to have a newly built house at a lower price, you also get to decide how each part of your home will look like. Get your money's worth by purchasing modular homes for Kinston families. Are you interested in modular homes for Kinston families? Let Home Connections help you find and build the one you like. We have been offering families and individuals an affordable and quality housing, including modular homes in Kinston, since 2004. With our help, you and your loved ones can have a safe place to call your own. Are modular homes in Kinston to your liking? Home Connections can help you find the one that suits your style and needs. If you can't find floor plans for modular homes in Kinston that appeal to you, just give us a copy of your desired layout, and we'll start working on it. For more information, give us a call at 910-298-3387. Some prefer mobile and manufactured houses to traditional or site-built homes. These individuals can't be blamed. With its economic benefits, prefabricated housing allows homeowners to lead a practical and fulfilling lifestyle. This may even be further optimized if a buyer works with a leading prefabricated home retailer like Home Connections. Based in North Carolina, Home Connections is an established retailer of manufactured and modular homes. We provide Americans with an ideal path to homeownership by offering first-rate factory-built houses at the most favorable price. When constructing manufactured and modular homes, our team pays undivided attention to the finer details and delivers excellent designs for unmatched functionality and elegance. Consider us your dependable one-stop shopping source for all your manufactured and modular housing needs. Home Connections aims to connect families with the "American Dream." By retailing sustainable and high-quality prefabricated houses, our team brings a new era of homeownership to the North Carolina area. We offer the best traditional housing alternatives, which are manufactured and modular homes. Formerly known as a trailer or mobile home, a manufactured house is a unit that's primarily or entirely constructed off-site and then transported to the final building site. These housing structures conform to the Manufactured Home Construction and Safety Standards, also called the HUD code. Manufactured homes also rest on a nonremovable chassis that's designed for over-the-road transportation. Should the homeowner decide to reside in another area, manufactured homes can easily be moved on their wheels. Manufactured and Mobile Homes: What's the Difference? Some use manufactured homes and mobile houses interchangeably, but they're two different housing models. Considered the predecessors of manufactured housing, mobile homes are developed for people who are always on the move. These livable spaces are placed on platforms with wheels, which are designed to be pulled by automobiles. The mobile home trend went on until the U.S. Department of Housing and Urban Development created the HUD code in 1976. Since this set of standards took effect, mobile houses have been called manufactured homes. The switch from mobile houses to manufactured homes is beyond a simple name change. 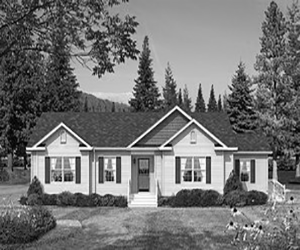 Built to the HUD code, manufactured homes have undergone the highest standard of home construction and design to date. This makes them far superior to older movable homes and an increasingly popular housing option on the market. At Home Connections, we put a premium on the satisfaction of our customers and strive to create lasting relationships with them. That's why we offer manufactured housing that can give our customers the most value for their investment. If you purchase a manufactured unit from us, we'll go the extra mile to meet your housing preferences at a cost that won't hurt your finances. Modular homes are built in sections off-site. These premade parts are then transported on a flatbed truck to the property where they will be assembled. Unlike manufactured homes, modular housing units are built on a fixed foundation. Additionally, these structures conform to the construction code that's implemented in their final building site. We at Home Connections work with a focus on quality and integrity. Apart from being a factory-built housing business, we're a licensed general contractor. Our staff of diligent professionals strives to complete every project down to the client's most minute specification. With our extensive knowledge in building codes, we also make sure that all our processes are performed in compliance with the law. Turn to our team for superb modular housing solutions, and let us construct your ideal home. Are you planning to buy a house? Live the American Dream with our economic and sustainable housing solutions! At Home Connections, your dream home is within your reach. Get in touch with us today at 910-298-3387. To learn more about our company, visit our website. Make us your first business choice. Manufactured & Modular Home Retailer in N.C.
"Smart Website Design for Small Businesses"